The only AIOps solution for Microsoft integrations that gives you deep business insight and control over critical business processes. We didn’t jump on AI and machine learning when it became The Next Big Thing – we had it as our starting point, and took a hard look at how we could best apply it to solve real-world problems. 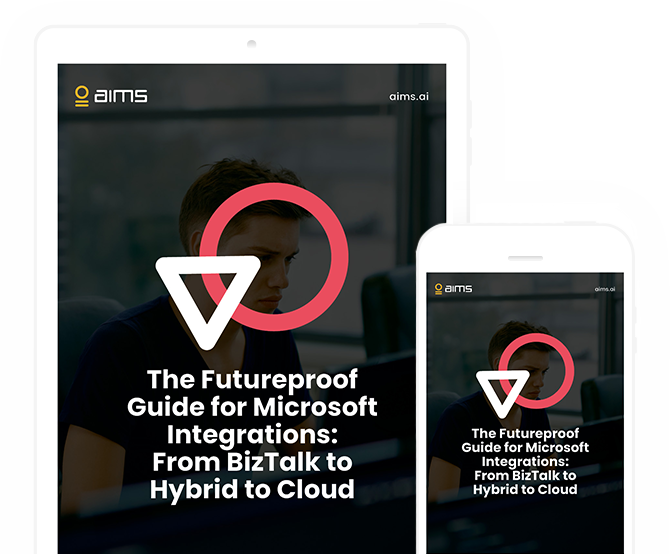 AIMS applies machine learning technology to provide deep insights into transaction flow through on-premise, cloud and hybrid integrations. AIMS automatically generates a dynamic 360° map of all the hidden corners of your IT systems and data for predictive anomaly detection and real-time insight into business critical processes. Companies using AIMS slash time spent on manual monitoring and troubleshooting, freeing resources to drive business innovation and build competitive advantage through IT. AIMS enables IT teams to impact business outcomes by making it easier to communicate system insights and performance data with non-technical business stakeholders. “AIMS gives us business intelligence we didn't have before. And with AI-driven anomaly detection, I expect to be more in control and enabled to respond proactively to any trouble coming our way." "AIMS helped us identify the critical business processes supported by our integration environment, and we built dashboards to help us monitor performance in real-time. We were also able to build custom reports that give various stakeholders the information they need." Deep monitoring for on-premise, cloud and hybrid integrations. Chart and correlate any metric across your IT environment. Create custom agents to fit your unique integration environment. Automatically set dynamic alert thresholds that adapt to business cycles. Create real-time reports for insight into critical business processes. Quick to install SaaS software with near-zero performance overhead. Push data and alerts from AIMS to issue management and other systems. Predict anomalies and non-events at an early stage and take action. Build visual dashboards to engage technical and non-technical stakeholders. Access alerts, reports and dashboards from any device. AIMS is cloud-based SaaS software, so you only have to install the necessary agents on the systems you want to monitor. TBC AIMS Talks Details Coming Soon! Read this expert guide and make sure your current Microsoft integration is ready to meet tomorrow's requirements – from BizTalk to hybrid to Azure. We’d be happy to show you how AIMS can give you insight and control over your integrations. Schedule a live demo now!